Drugs and Medication: It's re-think time! I got an email from a lovely lady called Judy from The American Recall Center asking if I would like to contribute a blog post to help raise awareness about the importance of drug safety. The reason they wanted a post is because this week (January 26th - 31st) is National Drug Facts Week. As I believe strongly in being as informed as possible about medications and drug therapies I thought it seemed like a great opportunity to join the conversation and write a piece for National Drug Facts Week. Thank you to Judy for bringing this to my attention (and thinking of my blog!) and also for providing the informative pictures included below. This is going to sound like a silly statement to make but I'm going to make it anyway...It's really important to understand what the medication you're taking is, why exactly you're on it and what it aims to do for you. So many of us are now on some kind of prescriptive medication or taking over-the-counter drugs. In western society we 'pop' pills like they're Tic Tacs, often with no thought to what the medications are really for, what prolonged use of them can mean or whether they're actually solving the problem. I'm not trying to scare-monger, nor am I advocating ditching medications. Far from it. Many conditions require the use of drugs to control or lessen symptoms. There's no disputing that. I myself have, over the years, needed a cocktail of drugs to manage symptoms and try to 'cure' my ill health. However, there's also no disputing the fact that a lot of the time we may not fully grasp the impact that taking prescription or over-the-counter (OTC) medications has on our psyches and our bodies. All I'm aiming to do with this short post is to highlight the need for us all to be a little more selective and careful when adopting new drugs or medication regimes. Ask your doctor or pharmacist if there is anything you can do that will compliment or support your health, without the sole help of medication or even before you try taking medication. Would a more holistic approach to well-being not reduce the amount of unnecessary antibiotics, antidepressants, sleeping pills etc. that are prescribed? An holistic approach could involve looking at the underlying cause for repeated infections, insomnia, low mood etc. I believe that the stresses and strains of modern life can make us more susceptible to becoming run-down. Some doctors fail to grasp the need to ask questions of their patients, to be more sensitive to their needs and to have empathy with their ills and ailments. Those few extra minutes of concern and care may alleviate the patient's worries and address their concerns. This could help set about a positive chain of results, rather than ending up with the patient clutching a sheaf of prescriptions for unnecessary drugs, which may end up masking the main problem. It's not necessarily a simple solution as it would involve a rather radical re-think in mainstream medicine. However, I believe it's an achievable and important solution to an endemic problem. Let's start seeing, hearing and treating people as a whole. I'm very excited to talk to you briefly about a Self-Love Series set-up and hosted by (the really, very awesome and lovely) Suzy of Eeep! I'm a blogger. You can hear what prompted Suzy to start this fabulous series here. This is an idea that I have, myself, thought about doing but I've never actually had the gumption to do it! So, I was thrilled when Suzy asked if I would like to contribute a piece to the Self-Love Series. I feel the series dove-tails with and compliments very nicely the aims of Life In Recovery. I'm excited to be part of something so proactive, positive and filled with a sense of community. As Suzy herself says: "The overall aim is for this series to create an ongoing community of people who can support each other towards feeling happier and positive in ourselves because everyone knows it’s hard to do things on your own. We’re not talking crazy diets, we’re not talking dramatic personality changes, we’re talking small steps towards a bigger goal. 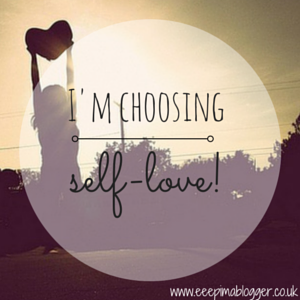 I want you to be part of what I hope is going to be an awesome self-love community. So, who’s in?!" There are going to be posts on Suzy's site popping up throughout January and February. Look out for mine on Friday 6th February...But until then, check out the archive page here on Suzy's site for all the incredible content from some amazingly talented bloggers that might help to boost your self-esteem, channel positivity and generally find a happier (and ultimately) healthier way of life.